Maurice Hilleman invented eight of the fourteen vaccines used in routine vaccination schedules today. In an unusually long and productive career in science he developed over 40 vaccines – an enormous number compared with more celebrated scientists, such as Pasteur, Sabin, and Salk. In fact, Maurice Hilleman is the most prolific inventor of vaccines in history. Countless millions of people owe their lives to his work. An even greater number of people have been spared permanent disabilities such as blindness and deafness. His vaccines may account for as many as eight million lives saved every year. Maurice Ralph Hilleman was born along with a twin sister on August 30, 1919 in Custer County, Montana, USA. His parents Anna and Gustave Hilleman were local farmers. Sadly, Maurice’s twin sister was stillborn and his mother died two days after giving birth. Death had become all too familiar in those days: the 1918-19 influenza pandemic had claimed the lives of 675,000 Americans and tens of millions of people worldwide, and deaths from infectious diseases such as measles, mumps, and rubella were common. Maurice survived a childhood diphtheria infection. I always felt like I cheated death. With Anna’s death, Gustave faced the prospect of raising eight children alone plus his farm work. His brother Robert lived less than 100 yards away on the same family farm. He and his wife Edith were childless. The couple agreed to relieve the pressure on Gustave by adopting baby Maurice. As Maurice grew up, he helped out on the family farm. He looked after the chickens, did a great deal of manual labor, and sold farm produce. Although his natural father Gustave was a member of the Lutheran Church and a very religious man, his adopted father Robert was not religious; Maurice also grew up to be non-religious. Maurice attended Custer County High School, graduating in 1937. He graduated in hard times: America was still in the grip of the great depression, and millions of people were unemployed – the national unemployment rate was about 17 percent. Times were hard when Hilleman was growing up. This photo shows the scene outside a soup kitchen offering free soup to unemployed people in 1930s Chicago. Maurice was lucky enough to get a job at J.C. Penney’s, but one of his brothers wasn’t impressed. He told Maurice he should aim higher and get a college education. Maurice won a scholarship for Montana State University in Bozeman. He put into practice there the lessons he’d learned during his childhood, working like a Trojan. He graduated at the top of his class in 1941, age 21, with a bachelor’s degree majoring in chemistry and microbiology. Unable to afford medical school, he decided to apply to do a Ph.D. in microbiology. He applied to 10 graduate schools. To his astonishment – he looked on himself as a country bumpkin – all 10 offered him full scholarships. He chose to go to the University of Chicago. In 1944 he graduated with a Ph.D. in microbiology. Fighting off significant resistance from his university he abandoned academic life, opting for a career in industry. Maurice Hilleman was the greatest inventor of vaccines the world has ever known. His vaccines were based on the idea used by earlier scientists such as Louis Pasteur, that you could take a virus and weaken it. The virus would then be too weak to cause disease, but would push people’s immune systems into producing natural antibodies. These antibodies would give people natural immunity to the full-strength, disease-causing virus. Hilleman joined the pharmaceutical company E. R. Squibb in New Jersey in 1944. He developed an effective vaccine against Japanese B encephalitis and worked on the mass production of influenza vaccine. In 1948, age 28, Hilleman moved to Washington, D.C. to join the Department of Respiratory Diseases at Army Medical Center. There he became an authority on mutation in influenza viruses, observing two different mechanisms for genetic changes in influenza: drift, a gradual annual change in the virus; and shift, a less frequent but more dramatic change in the virus. If shift happened in a highly virulent variant of the virus, deadly pandemics could result. 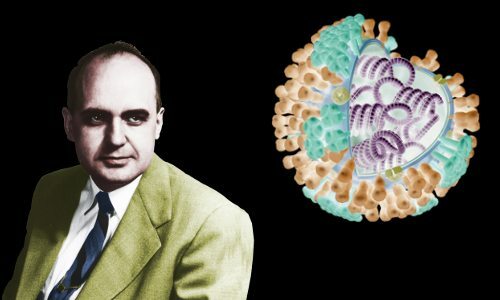 In 1957 Hilleman was the first person to identify that a new strain of influenza first seen in Hong Kong had the potential to cause millions of deaths worldwide. He mass-produced a vaccine in just four months and 40 million doses of it were distributed around the USA. The resulting large-scale vaccination program disrupted the spread of the virus and limited the number of American deaths to 69,000 – many fewer than would have taken place in the absence of the vaccine. Hilleman was awarded the Distinguished Service Medal for his work. In 1957, age 38, Hilleman was recruited by the pharmaceutical company Merck & Co. He moved to West Point, Pennsylvania, from where he would lead Merck’s virus and vaccination research programs for the next 45 years. At Merck he had unprecedented success, inventing a series of highly effect new vaccines to protect people against measles, mumps, rubella, chickenpox, hepatitis B, meningitis, and pneumonia. He never missed an opportunity to develop a new vaccine. In 1963 his daughter Jeryl Lynn got mumps. Hilleman promptly swabbed her throat for a sample of the virus. He isolated the virus and developed a vaccine against it. This vaccine, licensed in 1967, is part of the standard MMR vaccine used today. The MMR vaccine was also Hilleman’s creation. Hilleman was the discoverer or co-discoverer of several viruses. These included hepatitis A, SV40, and a number of adenoviruses and rhinoviruses. He was the first scientist to purify the drug interferon and he discovered that interferon’s expression is induced by double-stranded RNA. In 1943, age 23, Hilleman married Thelma Mason with whom he had two daughters, Jeryl Lynn and Kirsten. Thelma died in 1962. In 1963 Hilleman married Lorraine Witmer. Hilleman had a reputation as a tough and at times ill-tempered man. He worked seven-day weeks and expected people he directed at Merck to do likewise. Anyone who didn’t measure up to his expectations or the tough discipline he imposed on workers was quickly fired. At one time in his career he kept a display in his office of models of shrunken heads of the workers he had fired. His behavior as a manager was unusual but his research programs were amazingly productive, and he was idolized by those workers who lived up to his expectations. Hilleman retired from Merck at age 65 as required by company policy, but the company rehired him to continue as a ‘consultant’ rather than employee. He worked for a further 20 years as director of the Merck Institute for Vaccinology. In 1988, age 68, Hilleman received America’s highest award for science – the National Medal of Science – presented by President Ronald Reagan, adding to many other awards. An inveterate workaholic, Hilleman continued working until his death. Maurice Hilleman died of cancer at age 85 on April 11, 2005 in Philadelphia. He was buried near his home in Chestnut Hill, Pennsylvania. He was survived by his second wife, Lorraine, his two daughters, Jeryl Lynn and Kirsten, and five grandchildren. "Maurice Hilleman." Famous Scientists. famousscientists.org. 24 May. 2016. Web.